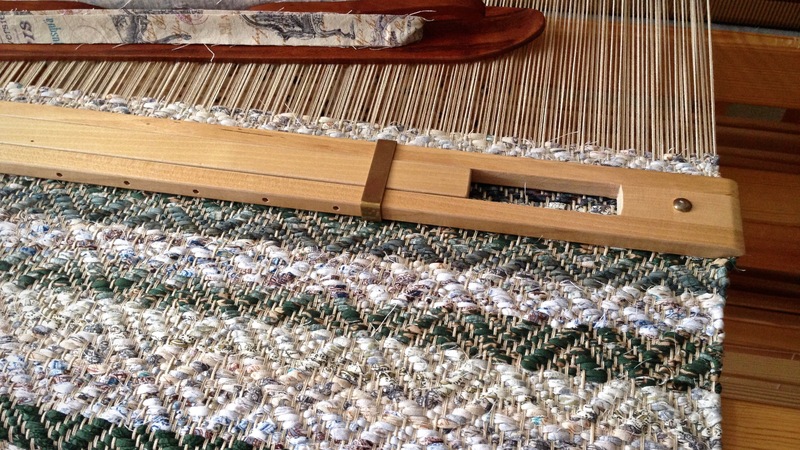 Two short rugs finish off this warp. One has a treadling sequence that produces a delightfully different pattern; and the other one has fabric strips for weft, making it a rag rug. I am scheduled for back surgery this week, so I have been working hard (a few minutes at a time) to get this project off the loom. I know I am facing some new limitations in the coming weeks. New treadling sequence. 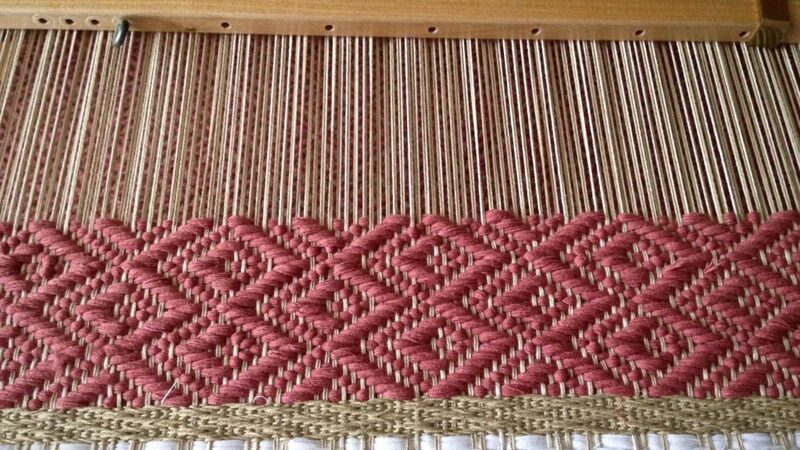 Stringyarn weft makes a well-defined pattern. Fabric strips, cut 2cm (3/4″) wide, are used for the weft. The intriguing pattern in the weave structure is more subtle with print fabric than with the stringyarn weft. Pain and weakness heighten our understanding of what truly matters. Faith, family, friends. The Lord, Himself, is a safe place for those who come to him for shelter. When we are feeble, he directs our hearts to a place of strength. He invites us into the protective shelter of his mighty and loving presence. You’ll find me resting there. And don’t be surprised to see a portable loom in my hands before too long. May your heart be at rest. PS I have prepared and scheduled my Quiet Friday post in advance so you won’t have to miss the unrolling of these eight-shaft block twill rugs! Your rugs are simply gorgeous. May your natural, divinely given health shine through. Hi Julia, I’m glad you like the rugs! And thank you for your kind sentiments. Thank you for your inspiration. Peace and Healing thoughts to you. I appreciate you, Angie. Thank you so much! Wishing you a speedy recovery after your surgery. Thank you so very much, Christine! The rugs are beautiful. Do exactly what the doctor says about recovery, It takes time. As some one with a bad back, learn to accept limitations. Plan good reading and hand work. Be patient with your recovery. Marie, I’m glad you like the rugs! Thank you for the wonderful advice. I’ll do as you say. I so appreciate your warm thoughts! You mentioned using 3/4″ wide fabric strips. Do you use them singly in the shed or doubled? I was trying it and with a plain weave rug it makes it too thin to call a “rug”. It made more of a table mat weight. Maybe if I try the twill rose path pattern it will turn out thicker. All the best with your surgery. I enjoy so much the spiritual insights here. Hi Lynette, I do use single 3/4″ wide fabric strips for most of my rugs. The rugs are lightweight, but because I firmly pack the weft, they are not flimsy. Most of my rugs have a sett of 8epi, but for this one I used a 35/10 metric reed, which is closer to 9epi (with doubled ends). You certainly can use 2 fabric strips for a thicker rug. Double binding rugs are naturally thicker because they have two layers woven together. Thank you so much for your kind well wishes! Prayers do surround you and your doctors for your surgery! May all go very well with your healing so that you may be able to weave your beautiful rugs again! Sweet Judith, your encouragement means so much to me! Dear Linda, I don’t expect it to be easy. It’s good to know I can look forward to smooth sailing after a short time. I will be holding you in the Light. Speaking from experience, when you get to that point, back surgery is well worth doing. You’ll feel a LOT better afterwards. Hugs to you, Joanna, you have touched me with your kindness. Of course you will have a portable loom in your hands soon. Your in my thoughts and prayers for a speedy recovery. Thank you for your kind expressions. That means a lot to me! Prayers for a successful surgery and speedy recovery, Karen! I really appreciate your prayers, Marcia! Thank you so much. Karen…again you touch me with the beauty of your weaving and your inspiration of faith. You will be in my prayers and thoughts. Please let us know, as you are able, how you are doing. Dear Annie, You make me feel so loved. I hope to report back early next week with a brief post. You will be in my thoughts and prayers through your surgery and recovery. Laurie, You are so sweet! That means so much to me that you and others will be praying for me. Oh my dear friend, I will be prayin for your surgery and a very speedy recovery. Please take care of yourself, we all need your inspiration and loving words. Precious Liberty, You are such a refreshment to my soul. Thank you for your prayers. You will be in my prayers for a good outcome from your surgery and a speedy recovery. Be sure you follow everything that they tell you to do after your surgery. Don’t overdo. Rest up. A portable loom is still soothing. You will be back with the big looms before you know it. Thank you so much, Carolyn! Great advice! I’m looking forward to some nice little tapestry weaving. Beautiful rugs, Karen! May your surgery go well, and may you soon be pain free. 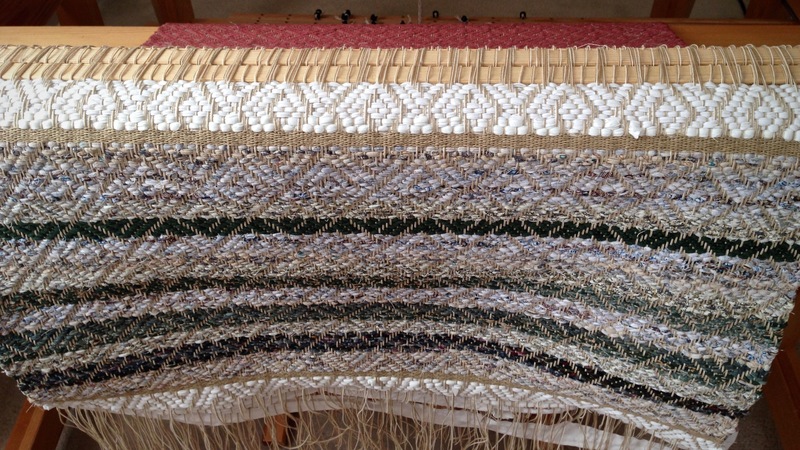 You can enjoy therapeutic tapestry weaving while your back heals. I’ll be thinking about you! Thank you so much, dear sweet D’Anne! Your kindness means a lot to me. I am looking forward to the quiet tapestry time I’ll have.